Spencer Fabrications has developed a solar lighting kit with a custom light enclosure for inclusion with the transit shelters provided to the local transit authority. Over 100 units have been deployed throughout the system. Other uses extend to parks and recreation shelters, carports or any other public or private structure requiring lighting. 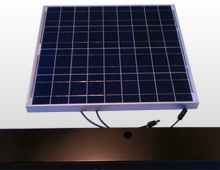 This system, assembled from commercially available components, is supplied with a custom enclosure that houses the LEDs, the battery pack, the controller, and the light sensors, and can be provided with a choice of a rigid or flexible PV panel. The custom controller is programmed to monitor light sensors for dusk to dawn operation of the LED lighting for up to five consecutive days without sunlight, and monitors the charging and discharging of the battery pack to maximize battery life. The flexible PV Panel is lightweight with the ability to conform to curved surfaces, and both rigid and flex panels offer superior life span, reliability, energy efficiency, portability, and power. Each unit is subject to rigorous quality control and testing, and is RoHS and Autoclave compliant, TUV certified, and meets various IEC standards. Spencer Fabrications stands behind our work by offering a limited warranty on the system and the manufacturer's robust warranties on the components. Our commitment to customer satisfaction, as well as our ability to fabricate custom enclosures to meet your requirements is what makes Spencer Fabrications stand out. For more information on this product, see the table below or contact us directly. 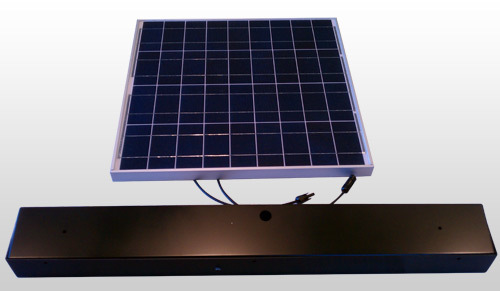 Custom controller programmed to monitor light sensors for dusk to dawn operation of LED lighting and to provide efficient monitoring of battery charging and usage. Custom Enclosure fabricated to meet customer design and space requirements.